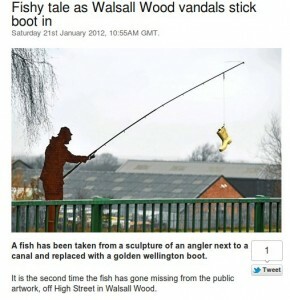 Followers of BrowhillsBob‘s blog may have seen that someone’s pulled a blinding prank on the Walsall Wood fisherman sculpture. The Express and Star have subsequently reported this, and, as is traditional, haven’t allowed the trivial matter of facts get in the way. Lies, damned lies, and journalism. The fish has, in fact, been missing for over a year, after becoming detached once, found and being refitted, (in fact, I remarked upon this fact here) so the prankster(s) have not removed it, merely replaced it with a rather fectchingly painted wellie. I think it’s brilliant, and will gladly buy those responsible a pint. This entry was posted on Saturday, January 21st, 2012 at 12:42 and is filed under YamYamBlogs . You can follow any responses to this entry through the RSS 2.0 feed. Both comments and pings are currently closed. stymaster on The end of the free internet? Species5618 on The end of the free internet?